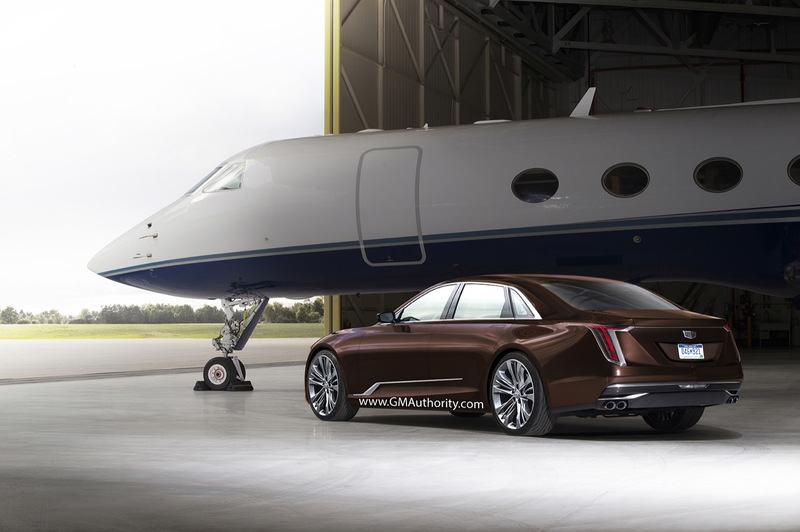 Earlier this month, we showed you how a convertible variant of the Cadillac Escala concept could look like. Based on the the comments, you were quite pleased with our version of the Escala Convertible, so we put our rendering artists to work on an Escala sedan. As it turns out, the traditional three-box shape works extremely well with the Escala’s design language. 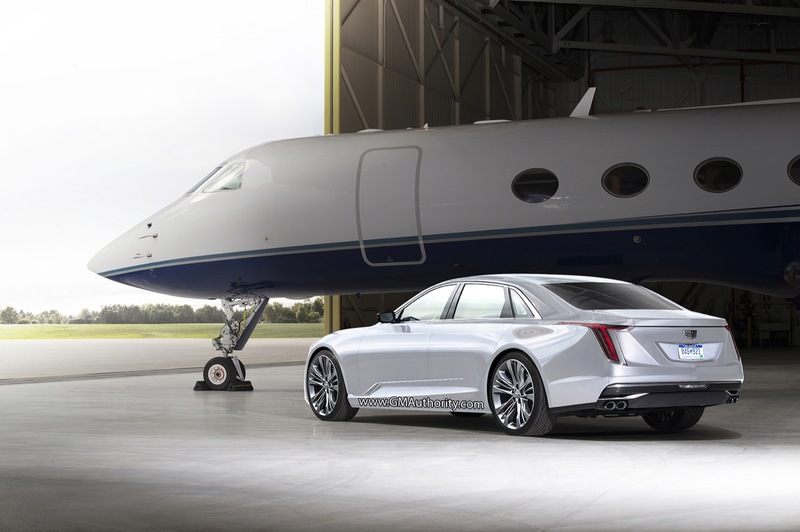 We relied heavily on the general design of the CT6 from the B-pillar back, and love the design of the resulting vehicle, especially the rear end, which is instantly-recognizable as a new-age Caddy. 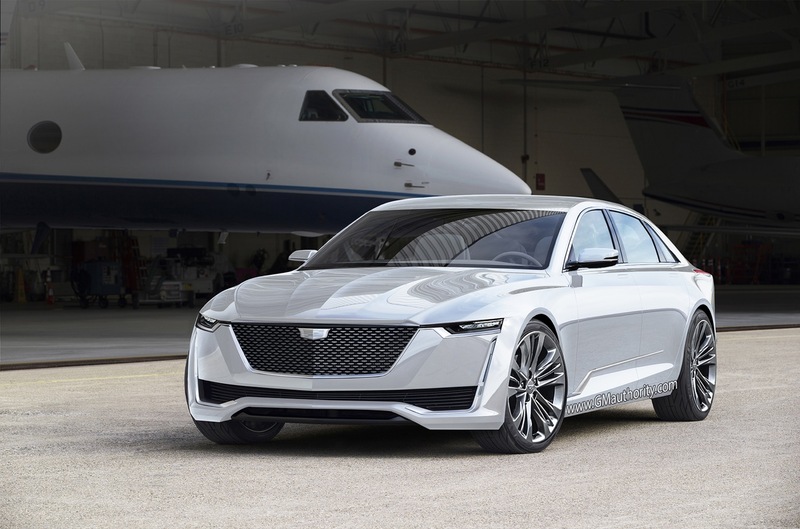 At this point, one thing is crystal clear: the more we render the various Escala variants, the more we realize that the design language introduced by the original fastback-like Escala concept is extremely pliable, and can be used on pretty much any body style, door count, and size. 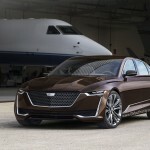 We’ll have to wait for the 2018-2019 calendar year to see vehicles with the Escala’s general design philosophy, as replacements for the ATS (expected to be CT3) and CTS (CT5) roll out alongside vehicles that place Cadillac into segments (like the sub-ATS car believed to be called CT2). Until that happens, enjoy these renderings. 2023 Cadillac CT6 ?? ?……the roofline is still a little too rounded for a Cadillac. that being so it’s still a lot better than the hatch back. 2023 CT6? 8 year seem a little long for a replacement for the CT6. 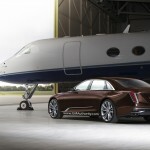 Alex, If its true that the XTS is staying around, wouldn’t that be the next CT5? As I pointed out in some of my other posts I cannot see Cadillac keeping the name XTS to help confuse people more then they already are with Cadillacs naming structure. I am just curious of your opinion on that.. Of course I still wonder if that was just a zinger JDN added to throw people off and the car is indeed still going to die off. If the XTS does get a name change, I wouldn’t expect it to be CT5. From what I understand, the CT5 name is reserved for the next-gen 5-series rival (CTS replacement), aka project A2LL. But I think it’s vital to note, as part of any XTS-related conversation, that the life-cycle of the XTS has been extended (as per JDN) by a few years, but not indefinitely. In that regard, the next-gen CT# vehicles still appear to represent Cadillac’s “true” lineup… while the XTS is being updated to stick around in the name of sales volume (and fleet sales volume). Even so, it still doesn’t appear to be part of the brand’s long-term product plan. I am a XTS owner in Shanghai The fact in China market is that the XTS still is most welcomed sedan for his cost performance.The CT6, it was still a marginal product though its opponent was BMW 5L and Mercedes E L or audi A6L in china markert Instead of between 7 and 5 . 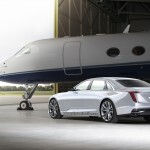 In my opinion Cadillac should developed a CT6-L or bigger sedan just like w222 S class. Speaking of size, can we all just appreciate how a three-box profile is better at conveying the true size of the Escala than the liftback? The Escala looks midsize like the Mercedes CLS and Audi A7, when in all actuality it’s bigger than the CT6. Wow way better in a lighter color. Nice. Also, this thing needs to be in an estate/wagon form. 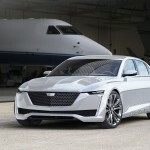 No, this would be the flagship CT 8 ! This rendering is much better than the liftback ! Give it a hybrid powertrain (upscaled from the CT6) and it will be a winner in every aspect. Lot better than the lift back. Need to put the badge center grill. What are the deminsions of this vehicle? Is the wheel base and width the same as the CT6? Cadillac list the Engine as a 4.0 on their site while every where else it is listed as a 4.2. It dose look great. Even though I think the Escala looks good, this looks much better. It shows the staff of GM Authority has more common sense then the pathetic upper management of GM. what about a tall wagon or a CUV. Cadillac has already announced that the CT8 has been canceled; thus, any Escala inspired sedan and gives a clue to the direction for Cadillac will most likely be the replacement car for the CTS as this is sort of the car that started the rebirth of Cadillac with the second generation 2008 Cadillac CTS. Rebirth began in 2003cts and sts. Both of which the V models got the momentum going. Cadillac needs another rebirth and get rid of all the plastic in the cars…..Cadillac still have too much plastic inside and out…..that is what’s causing global warming. Adding more metal to cars add weight, increases fuel consumption, which increases C02 emissions, which contributes to global warming. Oh please global warming is a hoax. But because you say it is, it must be true. Give your head a shake or better yet stick it back in the ground. Could the render guys here on GMAuthority render it with emphasis on the vertical lights? Or with headlights that mimic the taillights by swooping over the wheel arches? 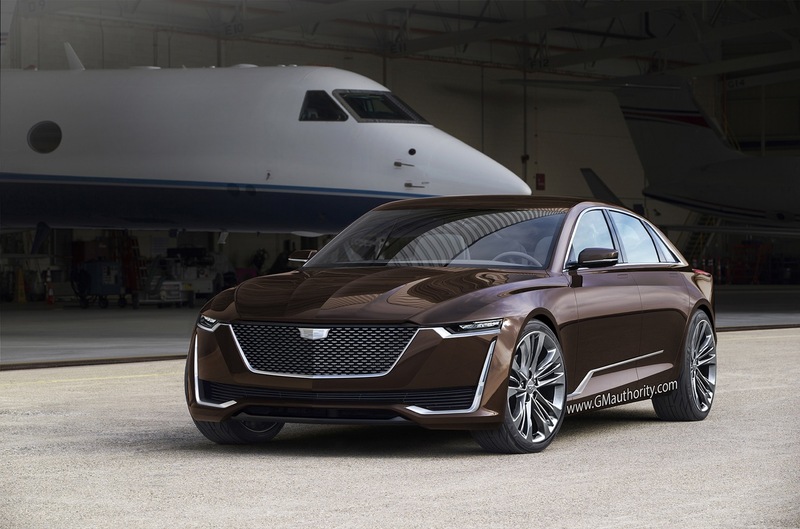 I believe that the Escala would really pop with more expressive, Escalade-like headlamps. they can replace plastics with carbon fiber and lightweight and strong aluminum and have no plastic…..here is where your wrong……plastic is crap quality and the number one cause of global warming. Honest question: Do you have autism? Awesome Sedan rendering . Is Cadillac going forward with the non-colored crest ? We see it on the fenders of the XT5 and CT6 but the Escala has it now on the front grill . If Cadillac is aiming for the Germans like Audi , MB and BMW or even Lexus all are just chromed emblems . I’m not sure they should , they just got rid of the wreath which has grown on me as looking ok , however the main emblems on the deck lid and grill should retain the colors in my opinion . They could dress it up a bit though with a jewel like effect which would look more upscale than the current badge . I like the brown color , GM really needs to come up with some different colors . this looks better if you ask me. the original reminds me of the jaguar xj with some genesis sedan IMO. this is more in line with the CT6 lines and it has a much better look overall. I’m just not a fan of the horizontal element in the rear lights, but definitely a fan of the new face.